I've been having a recurring problem for the past year with Quicken refusing to download recent instructions. I've spent *DAYS* trying to solve this problem. Tech support from Quicken and the bank were not helpful. In desperation, I built a completely new data file. This worked for a couple of months, and then the problem came back. I've seen the problem on both Quicken 2014 and Quicken 2017, so I don't think the problem is tied to the version of Quicken. 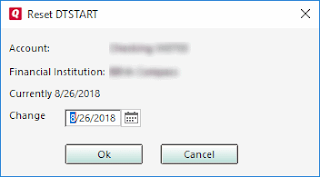 If you try to Update while you have transactions that you haven't accepted, then Quicekn doesn't download anything, but DOES change the start date for "interesting" transactions. This prevents new transactions from downloading. Accept the transactions from ALL of the accounts for this financial institution. For example, if you have Checking, Savings, and Overdraft for a particular financial institution, then the accounts will transactions to reconcile will show a red flag in the list of Accounts on the left side of the screen. 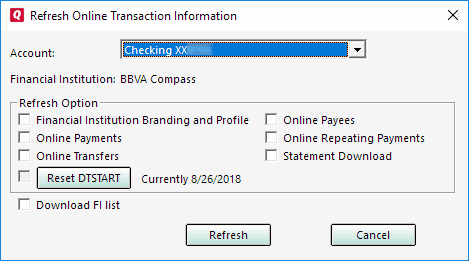 Go to each of those, click on "Downloaded Transactions" underneath the register, and click Accept All. Look at the date of the last downloaded transaction in your register and remember that date. On the Quicken menu, select Tools | Online Center. In the Account droplist, select the account you need to update. Note the date next to the Reset DTSTART button. It most likely has today's date. In my case, I took this screenshot on 8/26/2018. Change the date next to Change to be the date you took note of in Step #2. Click Update/Send... in the top right. Make sure the relevant financial institution is selected.